When it comes to running, I live in a bubble. I spend some part of every day running, or coaching, or writing, or thinking about running. My social life revolves around running. I frequent running websites. I stream obscure races and meets from around the world to my laptop at odd hours of the day and night. I am writing this in my dorm room at a running camp. All of this makes it hard for me to see the big picture: to see that people like me represent a very small fraction of the running population of this country. Vastly more people run for health or recreation than for prizes, and those people likely do not obsess over intervals, tempo runs, and weekly mileage. The fact that I have spent a lot of my life trying to get better at running, and trying to help others do the same, also makes it hard for me to understand the following recent phenomenon: American runners are slowing down. 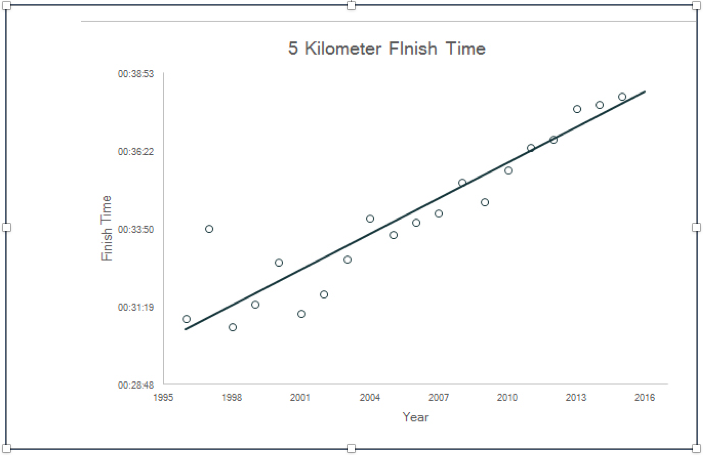 Or, to put it more precisely, average race times across a variety of standard race distances have been slowing steadily for at least two decades. The study in question, with the depressing but direct title, “American Runners have never been slower,” was led by statistician Jens Jakob Anderson of the Copenhagen Business School and assisted by mathematician Ivanka Andreeva Nikolova. It looked at a massive amount of data from races over the past twenty years, some 34 million road race results from 1996 to 2016. Although some of the slowdown reflects greater participation by female runners over that time, the effect cannot be explained solely by that shift. Likewise, the slowdown cannot be explained by an increase in the number of walkers, or very slow runners. My first instinct on reading the Washington Post article was to regard the findings skeptically. After all, I reasoned, there isn’t any such person as the average American runner. There are only runners, and some of them are getting faster and some of them slower. New runners are entering the population and old ones are dropping out. And a lot of them, like me, are aging. If the average is slowing down, it’s probably because of some such statistical fluctuation overlooked by the authors, like having more of us hanging on into our 50s and 60s. I considered leaving it at that, but the question of age kept bothering me, so I decided to reach out to the authors of the study to see if they had any thoughts about whether an aging population of runners could account for the decline in performance. If so, the study would still be interesting, but there would be no mystery. To my surprise, I received a prompt and extremely helpful response from Jens Anderson acknowledging the question and providing additional data that had not been in the published study. They had considered the question of age. Specifically, they found that — although the average age of participants had increased from age 37 to age 41 over the past 20 years — the data showed that, like the other demographic trends they had examined, an aging population of runners could not explain all the slowdown. Basically, all age cohorts were slowing down. So, what could be the explanation? Is the slowdown the sum of many more-or-less benign demographic effects, or is it something else? In the published study, Anderson notes that the slowdown correlates well with several measures of declining health in the American population as a whole — for example, obesity rates — but he stops short of claiming causation. While it’s possible that runners are, on average, heavier than before, the data cannot prove this. But don’t these explanations beg the question? If the average runner today is slower today than the average runner of 1996 because today’s runner is not as interested in being faster, why is there declining interest in trying to be faster? And is that a good thing (as Grilk suggests) or a bad thing? I still can’t completely shake the idea that I’m missing something that’s in the data – some change or combination of changes that account for the near universal slowing of the broader running population (except for the very elite, who seem to be holding their own). Or maybe because I live in the bubble, I’m missing something far more obvious, an attitudinal shift like the ones offered by Young and Grilk. I remain skeptical that there’s a medical explanation, but perhaps that, too, plays some part. What I do know, is that if you hang around older runners, the ones who have been racing since the 1970s and somehow continue to drag their aching bones to road races today, you’re bound to hear some variation of “…it was different in my day…” And if you dig through musty archives for race results that pre-date web sites, you’ll find typewritten lists of names and times that evoke a world where 5Ks were virtually unknown, and a surprising number of runners were what we would call fast. You wouldn’t think that being fast would fall out of fashion, but then again, I live in a bubble, focused on my own little world, so maybe I was just out of touch. In a last attempt to get clarity for myself, I reached out to a former work colleague, Mike Newman. Mike earned his Ph.D. in physics, and does quantitative research for a living. He is on of the smartest people I know, and also happens to be a runner approaching his 50th birthday. Surely, he would provide insight that had escaped me. This entry was posted in Records & Statistics, Running Research. Bookmark the permalink. 8 Responses to What is happening to American Runners? I agree with your friend, Mike. It’s slower going for me too! Very interesting study/post. Older runners slow down as they get older — but not at first. The average speed will be affected by the rate that people take up running (increasing or decreasing), the rate that they continue to run for 7-10 years or longer, and the rate that they drop out entirely during the first 7-10 years of running, all of which information may be very hard to capture. Picture a meal passing through a python, where the height of the bump depends on where the meal has reached, and whether you are on the peak or the slope. A 4 years average age increase in such a short amount of time seem a lot to me. Also when I go to races now, even at 60 it seems that I still run in the first few rows at most of them and I know that I have slowed down – a lot. Without being a jerk about it, if you look at the after race photos versus the ones from earlier decades of the running boom the difference is pretty obvious. Back in 70/80’s even the back rows of the starting line had a different appearance than today’s back row has. If you can find photos or videos it is pretty evident. The slower runners then were faster than the slower runners now – that is not a new observation and one that I think most old timers see and talk about pretty regularly when we get together. One thing that I don’t see as much in races as I did before is the competitiveness, it seems that many races are more like a group hug than a competitive race – not a bad thing, but I think that running is loosing something and from your post and the study – that seems to be the slowing down of American runners. Seems kind of like the decadence and belief in everyone that finishes is a winner (shades of Harrison Bergeron) is setting into the running world beyond the front row at races. Somehow I think we as a nation are losing something and this small factoid is a part of that loss. I enjoy taking home an age group win as much as anyone, but at some point where do we draw the line and admit there is only 1 race winner and the podium is reserved for a limited number of people. When 30+ minutes in a 5K takes an age group what are we saying? When 22:00 wins the 5K race itself, is it becoming just who shows up to a race? Is that enough, just showing up? Well all you and I can do is keep training, pushing ourselves a little harder than the rest to keep our speed up for as long as it lasts and encourage others by example or coaching to get faster too. Because we are getting slower and we can only delay, not stop our inevitable slowing down. However, it does seem a bit sad to think that the times we ran and finished outside of the top 10 back in the day, would now be winning many local races pretty easily. It doesn’t bode well for running going forward…maybe it will be renamed – jogging. Running and jogging two different sports, but two words that can sure spark some heated debates, when it comes to who is doing what. So I actually come to a different conclusion – Americans are getting faster!! At the end of the article, the authors alluded to the increase in participation – but only to suggest that somehow this is leading the fastest racers to turn to other sports. But participation in all events has increased dramatically. For the marathon distance, while the “slowdown” has averaged 10-20% depending on the finishing place, the number of marathon finishers has increased a whopping 43% between 2000 and 2016! Of course, there are more races now than in 2000 as well; it shouldn’t shock us that that the 100th, 1000th, 2000th, and 5000th place finishers are slower on average – there’s an influx of large races that not geared towards the competitive runner (how many of our friends are training their hearts out for the Walt Disney World Marathon?) Just because there are more races and more finishers (another point – how many races in 2000 even kept the course open long enough for an 8 hour marathon finisher?) doesn’t mean the rest of us are all slower – it means that people who 16 years ago were sitting on their couches are now running and walking in 5k, 10k, half marathon and when inspired even full 26.2 mile races. The greater number of people is pulling down the average (whoever decided that 100th place means front of the pack clearly has not been to many local races). All the power to these newbies – and I would like to think that many of these new recruits will fall in love with the very addictive nature of wanting to go faster and further in their next venture! Marcia — even though the study was based on 34 million results, I couldn’t shake the feeling that it was talking about MY results, and how I was getting slower. It’s dangerous to take research personally! Robin — I had similar concerns about the data, but the authors of the study shared additional data (that was not in the published paper) and that convinced me that the effect of aging seen in the study was fairly consistent (on average) at different ages. For example, the slowdown from age 35 to age 38 was similar to the slowdown from age 36 to 39, 37 to 40, and so on. Still, you might be right that there’s a “meal going through a python” effect, I just haven’t been able to find it in this set of data. Harold — As we are almost exactly the same age and have seen almost exactly the same phenomena at races, your comments ring very true to me. You also describe very well that strange feeling of showing up at a race, finishing near the front or winning our age group, and feeling GUILTY about it! But you’re right that all we can do is keep training and competing for as long as we can. And as a coach, at least I can try to instill a positive, competitive mindset in runners in the next generation. Joni — You always see something that I miss! Yes, if you change the focus from “American runners” to “Americans,” you can say that Americas are not getting slower, they’re getting faster, as evidenced by the increasing participation. However, participation rates have declined slightly over the last two years, yet the slowdown continues. Another point that you brought up with the “100th finisher” observation, is that the study looked only at results from races of > 2000 participants. I asked the author about this, and he responded that trying to include smaller races would have made what was already a massive data collection task almost impossible. So it is possible that — if smaller races were included in the data — we might see something different. But of course, it might show more or less slowdown. I’m inclined to think (as Harold points out) that the slowdown would be just as evident in smaller races, but that’s just speculation on my part. I guess my comment on all this is, “who cares”? The best runners are still fast, and with the effort currently underway to break the 2-hour marathon, I don’t see any threat to competitive running losing its appeal. If more people are running who don’t care about hammering the course, that’s fine with me. And there are more races than ever, too. All this sounds like good news to me. Thanks for your comments, RBT. It’s reasonable to ask, if there are more races and more runners, why it matters if the runners are, on average slower. To the authors of the study, it mattered because they hypothesized that the slowing trend had something to do with declining metrics of overall health. If that were shown to be true, then slower race times would matter as an indicator of more worrisome trends. However, the authors freely admit that, while there is correlation, there is no proof of causation. To me, it matters for a different reason. The sport of running is changing. In my world (my “bubble”), running is about working hard and improving. It has been hard to accept that at my age, if I work REALLY hard, I can only hope to slow down the slowing down process. But I suspect that for the vast majority of people who run road races, working hard and improving just isn’t a priority. Is that bad? I don’t know, I just know it’s moving away from the sport I knew.